* Looking for card protector sleeves, boardgame component boxes, zip bags or replacement tile draw bags? Click here. Looking for discounts on boardgames? Click here. Most of the games we play are what are colloquially known as 'German', 'Euro', or 'Designer' games. These names come from the history of designer games - the most popular have predominantly been from Germany, though this has changed slightly in recent times with more coming from the rest of Europe and the US. If you're completely unfamiliar with designer games -- as I was not too many years ago -- it may take some time before you start to understand why these games have caught on with so many players. But if you make even a minimal effort to learn about them, I can almost guarantee that your time spent with friends will be the richer for it (to quote boardgames.about.com). Obviously, not every designer game is going to succeed on every level -- or with every player. There are many who love the work of game designer Reiner Knizia, for example; others would be quite happy to live their lives without ever playing another Knizia game. Most of the games we play are listed here at boardgamegeek.com if you would like to read reviews and explanations of gameplay. If you want to invite someone along (or yourself if you haven't come along before!) please let me know so that I can prepare. If you are inviting someone along, you should also be prepared to introduce them, and to sit with them through an intro game. Ask before opening someone elses drink or snacks. Don't take food from anyone elses bag. We usually have at least one, and often two, home stay students. If games finish after 10pm (which they almost always do), please be considerate in the noise you make inside and when you exit the house - be sure to close and latch the gate. Playing games with new people can make people nervous at first. You will be coming into an established group that normally knows each other well. You will want to make a good first impression. The best advice, as cliched as it sounds, is to be yourself. Just try to enjoy the games. Some players will take time deciding their moves, particularly in more complicated games, or towards the end of the game. If this annoys you, I recommend you avoid complex games later in the evening when people are more tired and this becomes more common. Once your first meeting is out of the way you will know the group better. Different people come on different weeks so while you'll probably meet the same people the next time you come, you'll probably also meet some new faces. Make more friends - introduce yourself! If you would like to use a computer for internet access just ask. We have a guest PC for visitors and can set up a login account for you on request. We also have wireless and most regulars have access to this on their assorted gadgets. If you would like to be added or removed from the mailing list drop me an email. The list is used to keep in contact for weekly reminders, as well as get-togethers (BBQ's, birthdays, movie nights). We also have an email list for announcing specials on boardgames, card protector sleeves, and so on. Let me know which list(s) you would like to be on. Currently I have 200+ boardgames on the shelf - all are free to play (and there are no membership fees). Additions whilst we had access to wholesale pricing included the Ticket to Ride card game, Stone Age, 10 Days in Europe, Linwood (another New Zealand game), Metro, Monopoly Deal (theme only - nothing like the old board game! ), Forbidden Island, Wildlife, thousands of cards from A Game of Thrones CCG (thanks Israel), Modern Art (thanks Jeff), Thurn and Taxis, Cathedral, and Pandemic, Dominion: Seaside, Dominion: Alchemy, Battlestar Galactica, Pillars of the Earth plus expansion, Drakon, Endeavor (designed in New Zealand! ), Race for the Galaxy, Weed, Age of Empires III: The Age of Discovery, and the Power Grid: Benelux/Central Europe maps, Powergrid Brazil/Iberia expansion map, and the Powergrid New Power Plants deck, the 1999 version of Acquire (much better quality than the cardboard re-release), Saint Petersburg plus expansions, Guillotine, Dominion: Prosperity and Hinterlands, Taj Mahal, Through the Ages: A Story of Civilization, The Gates of Loyang, Steam, Carcassonne Builders and Traders, Biblios, StoneAge: Style is the Goal, Coloretto, Starship Catan, Ticket to Ride India, Ticket to Ride Switzerland, Ticket to Ride: Heart of Africa, King of Tokyo plus the Powerup expansion, Wits & Wagers, Mascarade, Ora et Labora, Village, Perudo Liars Dice Game, Ikuza, Guildhall - Job Faire, Airlines: Europe, Timeline - Discoveries, Events, Inventions and Diversity, Eniment Domain: Escalation, Love Letter, No Thanks!, and Five Tribes along with many others. There have also been LOTS of other games purchased by club members and these are getting plenty of table time too :-). We have also ordered in replacement copies of Agricola, Alhambra, Bohnanza and High Bohn Plus expansion, and Settlers + several expansions. In 2014 I'd spent more than $2000 on games for the club before we even reached winter. A bit scary really! Buys are down heaps since we no longer have access to wholesale pricing on games from our previous supplier but we have still added (mostly from overseas purchases or MightyApe sales) a reasonable number of games in recent years including Tigris & Euphrates revised edition, a new copy of Puerto Rico, Five Tribes, Carcassone Hunters and Gatherers, Civilization, Skip Bo, Igor: The Monster Making Game, Istanbul and the Istanbul: Mocha & Baksheesh expansion, Cargo Noir, Seasons plus expansions, several Timeline versions, Castles of Mad King Ludwig, Splendor, Carson City, Fresco plus modules 4-6, Trains: Rising Sun, Jaipur, Bunny Bunny Moose Moose, Mai-Star, The Manhattan Project and Second Stage expansion, Evolution, Jacob Fryxelius's runaway hit Terraforming Mars (currently ranked number 4 strategy game on Boardgamegeek), as well as Dinosaur Island, the Kickstarter collecters version of Suburbia, Civilization: A New Dawn, Photosynthesis, Azul, and many more. 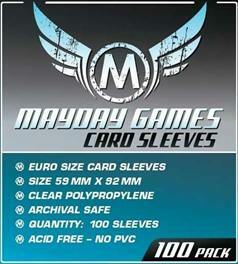 If you are looking for protective sleeves for your cards, the club is the New Zealand agent for Mayday Games and Swan Panasia. If you are a reseller contact me for details. We currently have over 100 different sizes of card sleeves covering thousands of board games, including the most popular Euro and Trading Card Game sizes (Dominion, Magic) as well as slightly odd sizes like Settlers of Catan, Thunderstone, Dixit, 7 Wonders, Civilization, and Powergrid. We even have self-adhesive tile protectors for Carcassone. Swan Panasia and Mayday Games also supply a small range of boardgames and Mayday Games supply a range of game accessories including wooden game tokens. For a fraction of the cost of your Euro games you can use these card sleeves to protect them from getting worn and dirty during play. Especially important if your friends eat food then play games. See our sleeving guide for the best fit. If you have a game not listed contact us here. These sleeves are made from clear archival safe polypropylene. They are acid free and contain no PVC. Pricing is dependant on how many packs you order, but to get an idea of pricing check out our TradeMe listings. If you are buying direct or in bulk pricing per pack is usually lower. Non local buyers can email for pricing. If you are local and have a game or two you are interested in, we have good deals from Megazone for club members. Alternatively, for the widest range of games (and best sales) check out MightyApe. MightyApe also sell computer games, DVD's, and a whole lot more. I've also had a chat with Dave, the new owner at Seriously Board, and arranged for a 10% discount code (now for local group members only sorry). Contact me for details. And, if you would like to "try before you buy", then BoardGameRentals might also be of interest. We have a club code of DGG2013 that you can use there for a 15% discount off any 2/4/6 rental or new game purchase. There is also a 30% off option for frequent buyers, email me for details. If you use one of our links, please let me know so I know who to thank, have some figures to use negotiating discounts in the future, can make sure any credits arrive (this includes anyone visiting our website for info on card protectors), and can offer you a suitable thank you discount if you need card sleeves in future. If you have any feedback on this website, how game nights are run, or general suggestions, please email them here. Protecting your games (card sleeves and accessories).